This past weekend, I took the kids Strawberry Picking at one of our favorite NJ U-pick farms, Lee Turkey Farm. Not only was it perfect weather for strawberry picking, we had a great time and picked a ton of juicy, tasty, super-sweet strawberries. After realizing 1) that I had no idea what I was going to do with so many strawberries and 2) I probably didn’t have quite enough to make jam, I decided to check out my dusty cookbook shelf. I stumbled across a random strawberry cookbook. It is small and shaped like a strawberry and is entitled “Strawberry Recipes”. I have no idea where this cookbook came from, but there are some great strawberry recipes in it. Tonight, we made Summer Strawberry Muffins. YUM! They are quick and simple to make and would make a great addition to a brunch table or as a Father’s Day breakfast. Preheat oven to 400 degrees F. Butter 12 medium muffin cups. (I got 12 regular sized muffins and 5 mini muffins) Mix together the flour, sugar, baking powder, and salt into a large bowl and make a well in the center. In a small bowl, mix the eggs, milk, and oil. Add egg mixture to well and stir into flour mixture until just mixed. Stir in the strawberries (and mint, if using). Pour the batter into cups and bake 20-25 minutes (mine took 23 mins). Let cool slightly and then turn out onto a rack to cool. 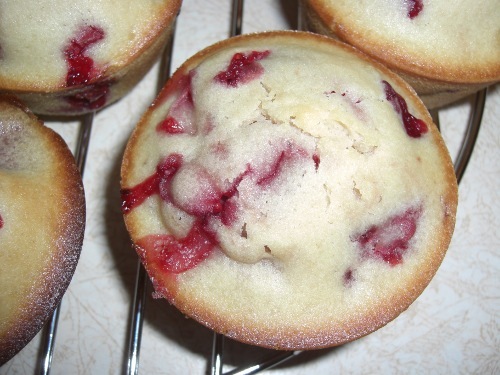 Strawberry Picking & Muffin Recipe has been posted in Crafty Mamamamahoney, Kiddie Mamamamahoney, Parental Mamamamahoney and Tagged: muffin recipe, nj u-pick farms, picking strawberries, strawberry muffins, strawberry recipes, u-pick in nj.